It's always interesting to leave the country and come back and see what things have changed. A lot can change in a year but I have to say the thing that changed the most was my own perspective. 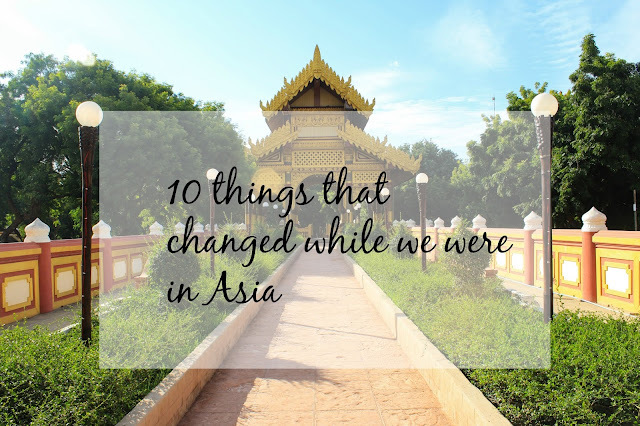 Here is a list of 10 fun things that have changed while we were in Asia. 1. Construction - or the lack of. When we left Wichita they were starting some major construction on bridges and ramps and when we came back it was all done! It's like they did it over night or something? But let's be real, they don't do construction quickly here in America. However, it sure was nice to come back to completed projects. 2. Essential Oils - Whoah, America! You all went crazy with this. I do like oils because they smell nice and I do think they have their time and place but it is like everyone I know has a big pack of oils or they ask me to tell either buy them or sell them. 3. Speaking of selling something, while away, I feel like everyone is selling something. Do you know what I mean? If they aren't selling Young Living then they are selling Norwex or something else. I'm not writing that out to be mean because I don't want to offend anyone who sells things, I just noticed that the year I was away, selling something became a big thing. 4. 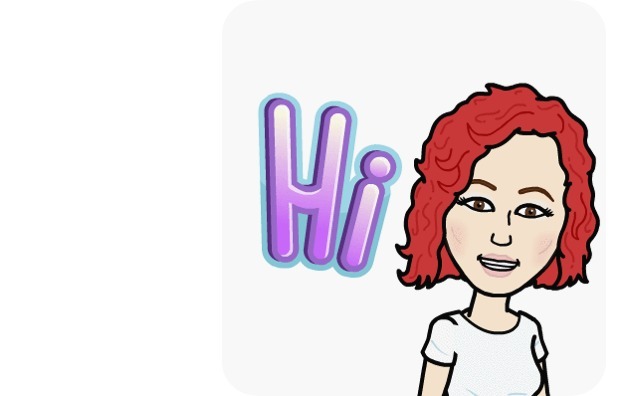 Bitmoji - Do you know about this? Let's be real! Of course you know about this! You weren't in Asia for a year. But just in case you don't know what it is, you can create a little cartoon of yourself and it has all these fun sayings the you can send. It's like emojis but you are the emoji. My friend Kinzie told me all about this this past weekend and now I'm hooked. It's hilarious. Here is me as a bitmoji. Do you have one? 5. Drive Thru's at Panera - Why????? When I came back, Panera had a drive thru? Why? That's a place to go and sit still not rush through the drive thru. That's America at it's best (or worst). SIDE NOTE - why is it drive thru instead of drive through? Come on grammar friends, help me out. 6. Fashion - Whoah! Let's just say I'm out of fashion. I went to a meeting and most of the women were wearing ankle jeans with ankle boots. Of course, I wasn't because I had no idea this was a style. Do you know what I'm talking about? 7. My Teeth - People have asked me what the biggest adjustment coming back was and I have to say it was my teeth. They hurt so bad!!! I'm pretty sure it was the change from 110 degree weather to 30's. I went to the dentist just to make sure nothing major was wrong and he did confirm that my teeth were just adjusting. Thankfully they are much better now. 8. LTE - When we turned our phones back on I could not figure out why it was saying LTE instead of 4G. I told Dave we were probably getting charged a huge roaming fee or some type of fee because of the LTE and then I was informed that it was just the newest and fastest network. 9. Phone Service - Why??? Why did they change this? Instead of getting a discount for your phone and upgrades you just now pay a set amount per month for 18 - 36 months. It's like a loan with no interest. That is weird to me and a sneaky way for phone companies to make everyone think iPhones or expensive phones are cheap. Not cool! How does your phone service work? Is it just my AT&T network? 10. My Perspective - I hope this change stays for good. I kind of chuckle now because things that used to bother me just don't anymore. I'll be riding in a car with someone and they get frustrated at the one car in front of them not going fast enough and I just want to say "Go to Burma!". After sitting in traffic for 30 minutes to go .25 of a mile, a slow car in front of me is no big deal. When people complain about the weather, don't even get me started! My reply is just "Go to Burma!" After living a few months in 125 degree weather and where the seasons are hot, hot and humid, hotter and hot and rainy I hope I never complain about the weather again. I also really get a kick when I'm on the phone with someone and they say "I'm so sorry our internet is slow." ha ha ha ha! They have no idea where I just came from. I mean the internet in Burma is pretty much horrific and slooooooooow and I just love that people say that to me so I can be reminded how great internet and technology in America really is. The amount of blessings God has given us in this country is just surreal and I hope I can remember that and appreciate it, always! Have you ever lived somewhere else and noticed changes when you came back? Do you have a bitmoji? Please say yes! Does anything on this list surprise you or stand out as funny? I think that the whole individual sales things goes in and out of style from time to time. A lot of my friends in America sell stuff but mostly they don't seem to stick with it very long...maybe that's because there's more people selling than buying...there's nothing I actually like enough to want to sell, but I can understand why it's a popular thing to do in our consumerist culture, because, in general, people like stuff! who would have known that your teeth have to adjust back to weather?! that is crazy to think about! this was a fun list to read! i agree about everyone selling something - it really does seem like everyone you know is! we really do live a fast paced life here & get super impatient over little things - i can see how your perspective would change after living in a country like Burma for a year! I had Bitmoji for a minute, but decided it wasn't worth the phone space. Maybe I'm just not cool. Also, I hate the new way we have to buy phones. I hate paying that extra cost on the monthly bill! I guess we'll never get free phones again! I've never heard of Bitmoji! That's fun! That's funny about the essential oils. I totally agree... we went kind of nuts. This was a really fun post to read. I never really thought about what might change if I were away for a long time like that. Oh, also the teeth thing! That is so crazy! So so good that your perspective was so changed by your time there. I had a hard time adjusting to life in the States when I first moved here for college because I didn't understand the petty things people would get upset about. It's different when you have been living in a place with a lot of extremes.